A couple of weeks ago I paid my first visit to Locust Point’s Wine Market Bistro for a planning dinner with my business school alumni club. Because obviously the best ideas are generated over a couple cocktails and three delicious courses. Obviously. If you are ever looking for a good location for private dining in the city, I can definitely recommend this place. 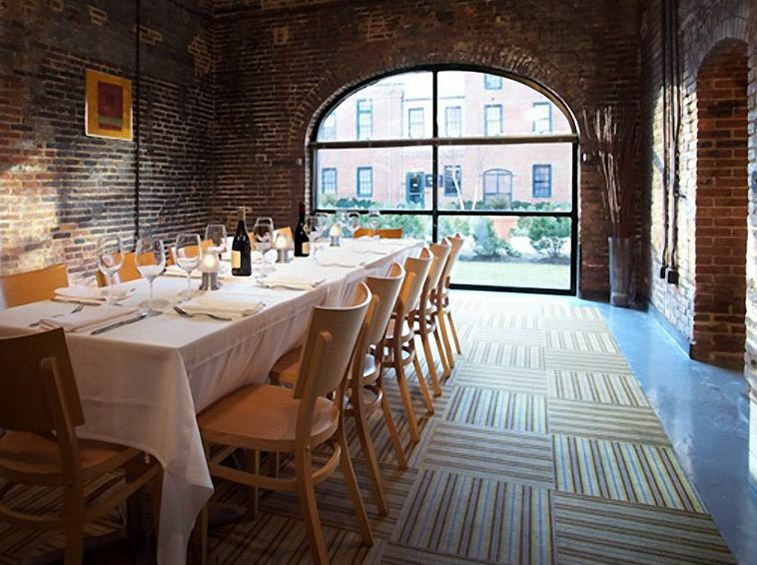 The room was gorgeous (see below pic I snagged from their website), the service was fantastic and the food was out of this world. I can’t speak to the pricing since I wasn’t paying, but their menu is on the pricier side so watch out for that. We had a special three course menu and so many of the options sounded good that I had trouble deciding what to order! I ended up starting with the house made pasta which was made with sausage, roasted onions, poblano peppers and cherry tomatoes. It was a generous portion and the flavors were fantastic. The pasta was cooked perfectly – not too soft or too al dente (I thought it was soo much better than the pasta we had a Cinghiale). 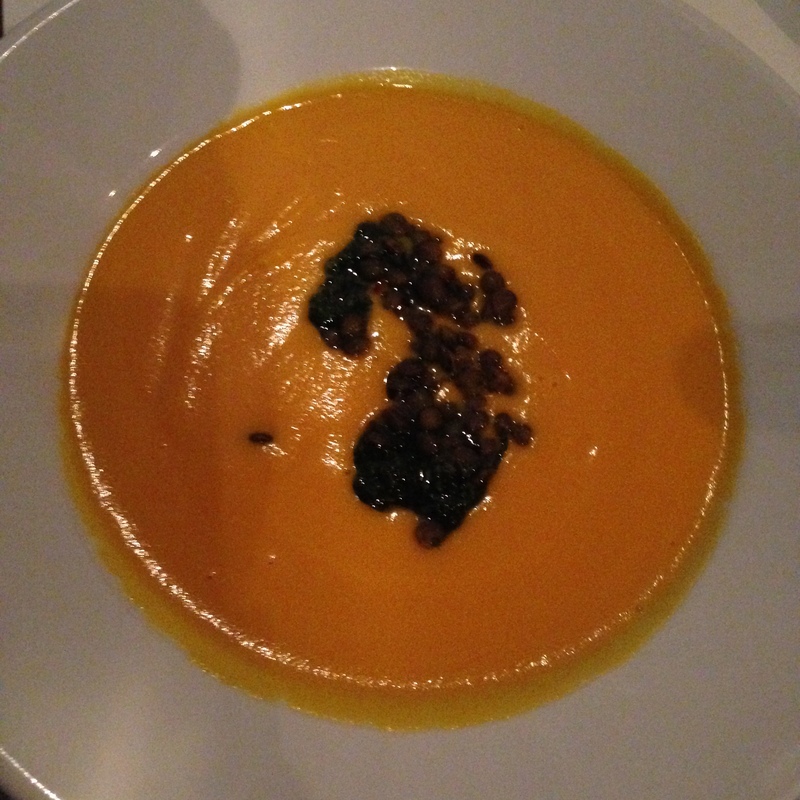 The carrot and coconut soup with lentils and the cornmeal fried oysters also looked fabulous. 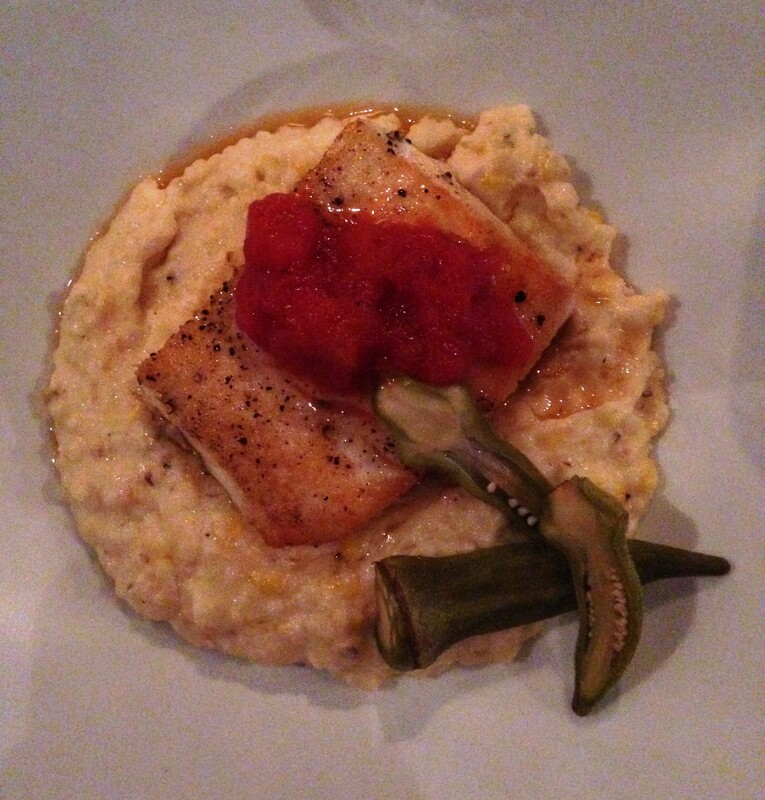 For my entree I had the halibut which was pan seared and served over sweet corn grits. It was topped with tomato jam and pickled okra. I discarded the okra but the rest of the dish was incredible. The fish was perfectly flaky and the tomato jam was an excellent complement. And the grits were so good my mouth is watering just thinking about them. I loved their interpretation of more traditional Southern foods. Like at many places, most of the dessert options had nuts (as someone with an allergy, I am always campaigning for more nut free desserts) so by default I had to go with the bourbon bread pudding with chocolate crème anglaise and cherries. Google tells me crème anglaise “is a light pouring custard used as a dessert cream or sauce.” Like my other two courses, this dessert was another winner. 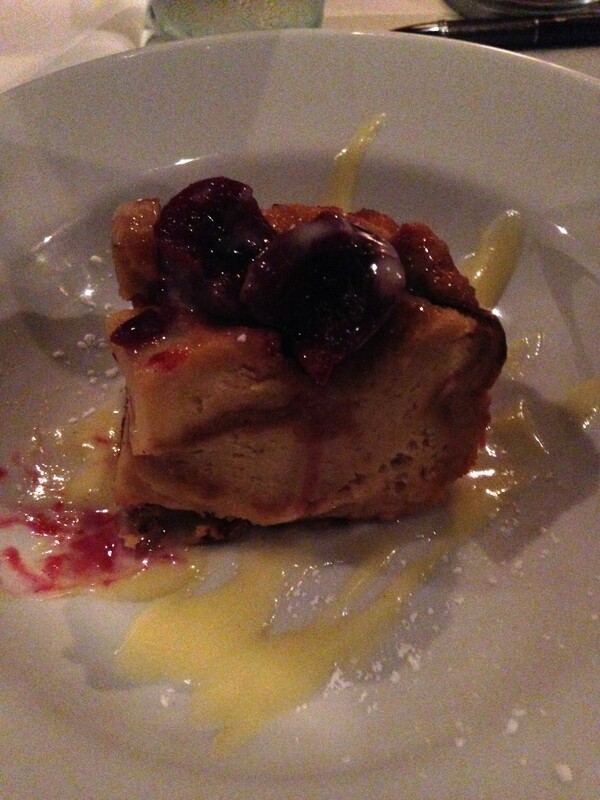 I don’t care for cherries so I just avoided them and concentrated on the bread pudding which was doughy and delicious, but could have used just a smidge more sauce. All in all it was a fantastic meal and great experience. The only negative was my first cocktail – it was described as a mint lemonade with cucumber vodka, but the cucumber flavor was totally overpowering. Clearly I should not have disregarded the name of the restaurant and for the rest of the meal I stuck to wine. If you are interested in checking out Wine Market Bistro, they have weekly specials including a neighborhood night on Mondays. If you are more excited to check out their wine selection they are hosting a wine tasting event on September 1st – $39 to sample over 25 wines and enjoy their passed apps (call 410-244-6166 for tix). 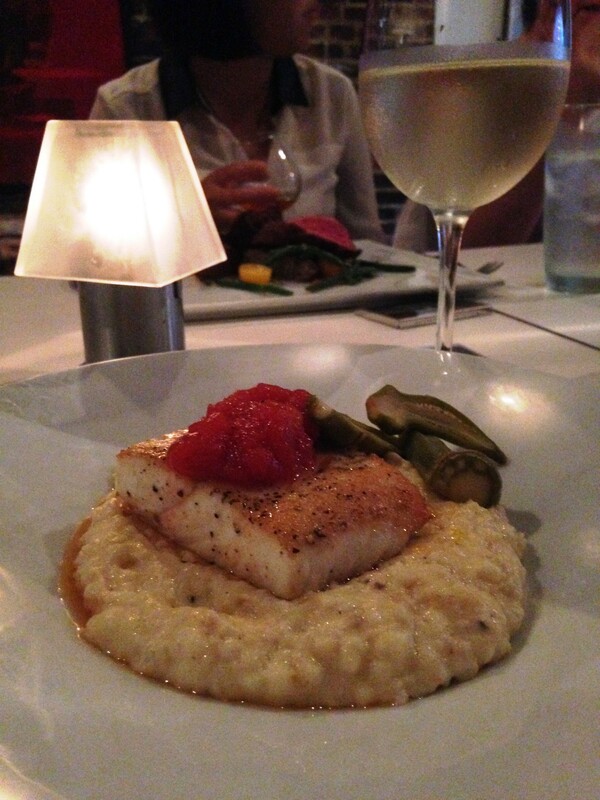 Highlights: Wine list, well cooked food with a Southern flare. Vegetarians beware – at Parts & Labor in Remington, they use all parts of the animals they serve which means even the bread is served with pig fat in lieu of traditional butter. Even I was a little squeamish about that one along with the fact that it is communal seating and that they don’t post their menu online, but my husband is a more adventurous eater than I am so I tried to get past all of that and go in with an open mind. I’m glad I did because the food was out of this world. The meat-focused menu is definitely unusual: it’s broken into small plates and salads, hearty plates, butcher’s cuts, sausages and sides. You are encouraged to order a bunch of different dishes and share which does get a little pricey but gave us the opportunity to try many different flavors. We had a 7:30pm reservation and when we arrived we were seated at a long table with two adults and four children. I was super impressed with how will behaved the kids were and how they seemed perfectly content with steak and corn on the cob for dinner (it isn’t exactly what I would call a kid friendly menu). Adam and I started things off with a drink – I got a cocktail our server recommended with vodka, fernet, sage and honey and Adam got a pony of beer. 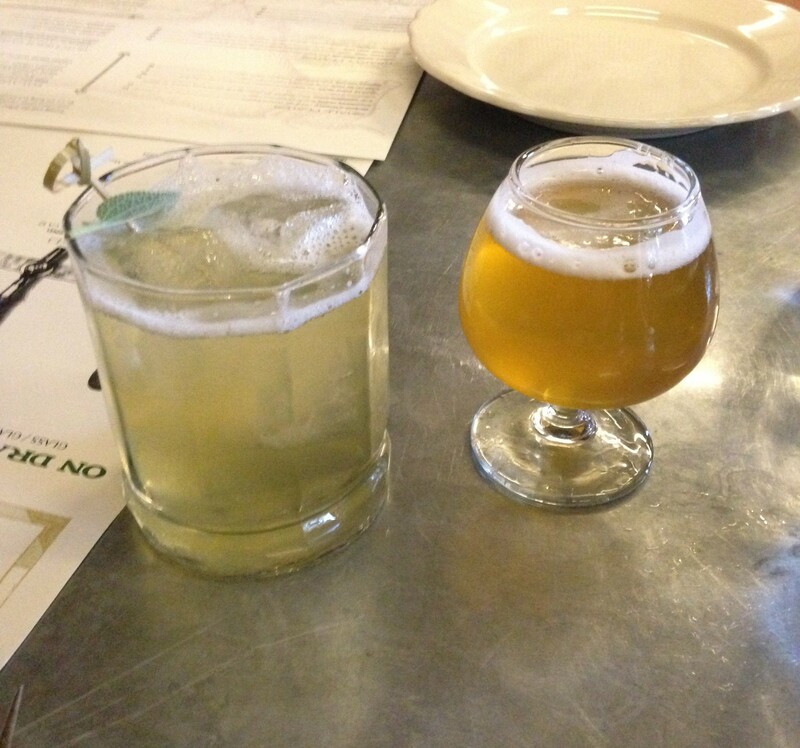 They have a fantastic draft list and ordering the small 5 oz pony allowed Adam to try multiple options throughout our meal (he started with an Allagash Confluence for you beer aficionados). When it came time to order we opted to try a little bit of everything and got something from every menu category except for the hearty plates. The handful of hearty plates are a little more like what you would expect to see on a menu with a meat served with some accompaniments. The food also comes out sort of like tapas, they bring it over when it is ready. This contributed to the only little snafu of the evening when the steak we ordered never appeared and it was only after we inquired that we were told they had run out of it. No worries though, we chose another steak off the menu and it was delicious. 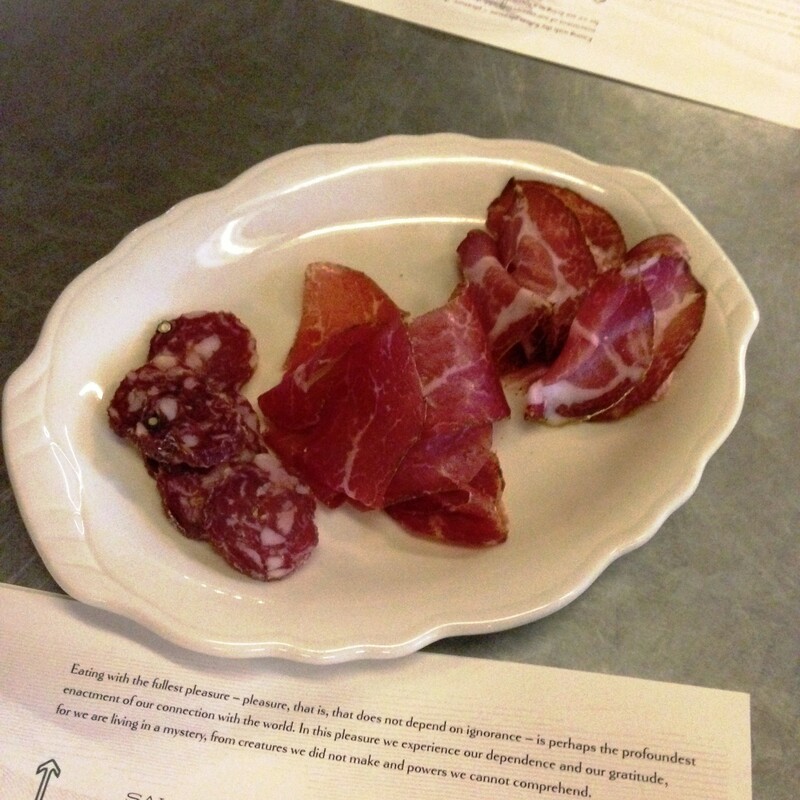 Salthouse Plate – from the small plates section, we started with some charcuterie: finocchiona, basturma and coppa. They gave an explanation, but I really have no idea what we were eating other than they were delectable salted, cured meats. The finocchiona was the favorite of both of us, it was a harder, chewier salami and the flavor was fantastic. Goat Sausage – we joked on the drive over than no way was I going to eat goat or any of the more unusual meats that might be offered. Well, I caved. 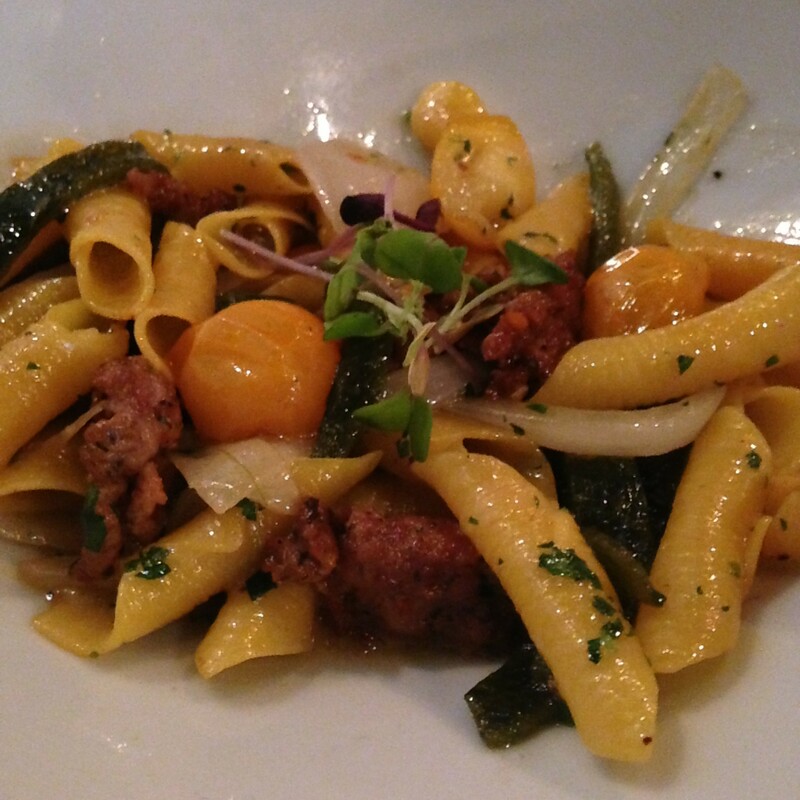 The goat sausage was served with tomato peach relish and it was one of the best things I ate all night. Grilled Summer Squash – thick cut zucchini and squash cooked with brown butter, honey and oregano. It was very good and had absolutely no meat which was a nice break from our animal-filled meal. Raw Cheeseburger – exactly what it sounds like – steak tartare served on tasty bread with all the traditional toppings you’d find on an actual hamburger. Or, at least the hipster version of those toppings: onions, dill pickles, egg yolk, tomato honey, mustard and fish pepper. This was definitely the most unusual dish we ate and one of the best. The flavors went really well together and the steak tartare taste still stood out – I was a little afraid the other things would overpower it but that wasn’t the case. 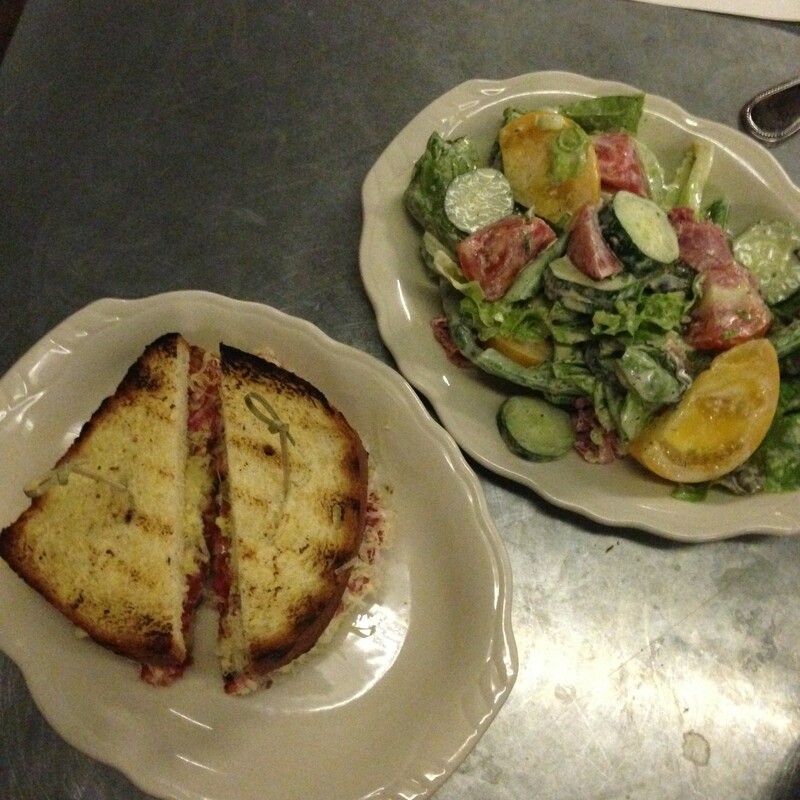 Bibb Salad – we saw one of these salads get delivered to a neighboring table and knew we had to order one. Bibb lettuce, green beans, cucumbers, tomato, smoked ham, scallions and a buttermilk dressing. The salad was fantastic, the green beans were nice and crisp and the heirloom tomatoes were juicy and delicious. The smoked ham (because obviously, more meat) had a great flavor that went nicely with the dish. Plate Steak – they offer four cuts of meat and we first ordered the flank. When we were told they were out of it we switched to the plate which is apparently the most similar. I had never heard of this cut of beef, but some googling tells me it’s also called skirt steak which I am more familiar with. 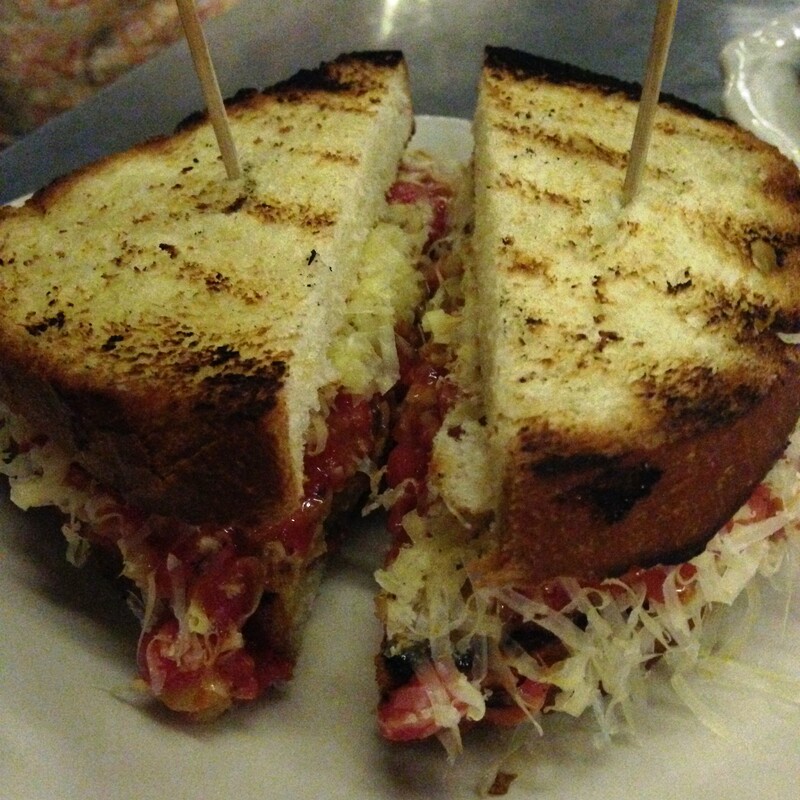 It was cut into the strips and served with herb relish. It was also delicious, but a little chewy. At this point we were super full and had the last few bites packed up to bring home to our dog, Jack. Highlights: Meat, meat and more meat. They aren’t joking around. They know their meat and it is delicious!